This page explains what is meant by 'wide-spectrum' research, bridging archaeology and geomancy, and its relevance to understanding the way that the people of the neolithic and bronze ages thought and saw their world. It is suggested that this pertains to our situation in the 21st Century. This is a study of the relationship of subtle energies with the landscape and society, examining the way that the ancients carried out geoengineering works to engage with the subtle energies of the earth, landscape, the heavens and time. 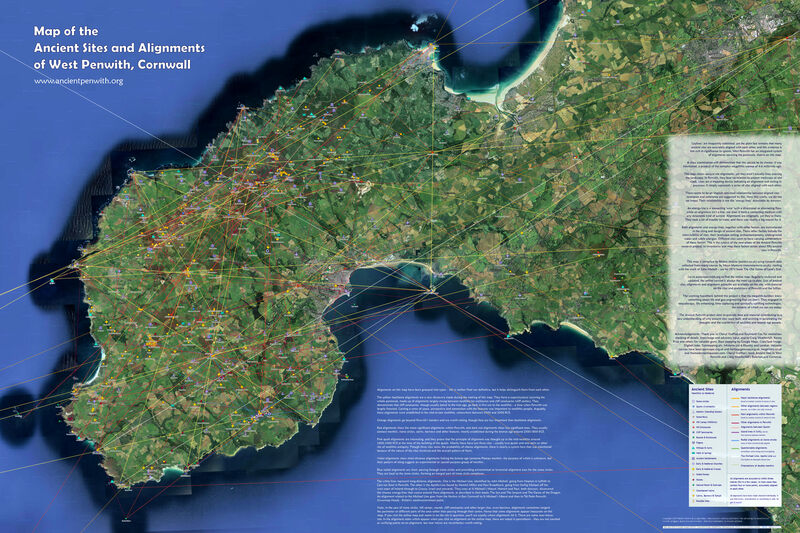 The first phase of this project has been the construction of an accurate map of the alignments of Penwith's ancient sites. It is probably the most authoritative, carefully verified and comprehensive alignments map in Britain. Archaeology studies the artefacts and remains left behind by ancient peoples, interpreting them from field evidence. This has had enormous benefits in understanding our prehistory in Britain, and also it has some limitations. Conclusions can be drawn only when acceptable evidence is found, and if not found, substantial gaps occur and theories and interpretations can thus be based on incomplete evidence. Ancient sites tend to be looked at as single, isolated sites, not as part of a complete, integrated landscape. Archaeology is strong on understanding artefacts and material remains, and weaker in understanding the sacred sites the ancients left to posterity - yet these were the highest and biggest expression of ancient cultures. Archaeology is also rather conservative - said to move forward one funeral at a time - and it can sometimes be weak on commonsense and imagination and sometimes distorted by interpretative bias. Such bias is influenced by a modern worldview back-projecting onto the past ideas and values from our own time. It involves a denial of the spiritual-magical aspect of the culture of ancient peoples. Thus, the findings of geomancers such as Prof Alexander Tom, John Michell, TC Lethbridge and other similar researchers is ignored or overly criticised. Thus, 'cliff castles' and 'hill forts' are viewed primarily as defensive structures, and cairns and barrows are interpreted primarily as funerary sites. 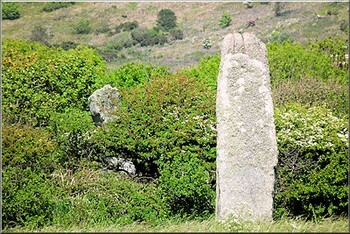 Menhirs and stone circles are regarded as incomprehensible, and the possibility that the ancients possessed an advanced understanding of mathematics, astronomy, physics, time and metaphysical realities is regarded as a romantic idea without being seriously entertained. Geomancy is the study of locational factors determining the placing of ancient sites in the landscape, drawing on evidence that is not scientifically or rationally accepted, except perhaps in the evening or at weekends and outside professional circles. This includes the study of ancient site alignments ('leylines'), sacred mathematics and geometry, archaeoastronomy, underground water, subtle energy and landscape artistry, whole landscapes and the relationships between ancient sites. The findings of geomancy are often regarded as weak or unacceptable for several reasons. First, archaeology regards humanity to have evolved from an ancient primitive state to an advanced state today, while geomancy regards the ancients to have been in some respects more advanced than today, seeking to reclaim lost knowledge and wisdom. Both disciplines tend therefore to fit their findings into these framworks. Second, geomancy has had its fair share of fantasists, erroneous ideas and poor thinking, and also pioneering ideas ahead of their time. This has led to a wholesale rejection of all geomantic findings as flaky and unreliable. Third, geomancy includes a subjective component, including feelings and visions, which today are not trusted. Fourth, subtle energy, difficult to measure using current scientific instrumentation, is unaccepted by science and academia, even when verified by multiple means or sensed by the personal experience of perfectly sane, intelligent people, including scientists themselves (or their wives). Fifth, the repeatability and verifiability clauses inbuilt into scientific research are often difficult though not impossible to fulfil by geomancers - though this is also a matter of interpretation. Finally, blanket rejection of geomancy and paraphysics leads to a lack of proper, verified, comprehensive research, since the research that is done is usually carried out by amateurs in their spare time and at personal expense, or by experts whose credentials are not accepted in mainstream circles. The Ancient Penwith project has feet in both camps, seeking to bridge them. This site is a repository of material arising from the Ancient Penwith project. The site is run by Palden Jenkins, who lives near Sancreed in Penwith. Palden has been involved in geomancy and related subjects for decades, also being an historian. He is the creator of the Map of the Ancient Landscape around Glastonbury and is privileged to have known many archaeologists, geomancers and dowsers. Other collaborators with this project are mentioned on the next page.